Super savvy Design Team member, Sav O’Gwynn, has a simple solution to spruce up any present. She’s monogrammed a pink Colored Tag with bedazzling gems and tied it to the top of a gift bag using generous amounts of Divine Twine. The gift just went from simple to sensational! She’s used Orange and Cotton Candy but choose any color to match your wrapping. Or…. use a Bigger Bitty Bag for your gift wrap… just a thought! For more inspiration from Sav, visit her blog. I have a pretty and playful project for you today created by design team member, Marie Ramirez. This scrapbook is layered with fun ideas for keeping the memories that you make! I especially love the hint of Lemon Divine Twine on the front cover. This book is called “Summer” but it could just as easily be called Holiday 2012, Winter Fun or Baby’s First Year — you get the idea! Bitty Bags are thoughtfully layered to hold various treasures – tickets, photos, newspaper clippings, journal entries and the like, while Colored Tags provide the perfect surface for making notes or labeling pages.Feel free to use your favorite supplies to give it your special flare. Or, get your kids in on this one. Wouldn’t they have a blast putting this together?! For more of Marie’s work, check out her blog: Life Inside the Music Box. Here’s a clever idea for staying organized in 2013. The always inspiring, Jan Ely, has created a practical, and dare I say – cute!, greeting card organizer. She has used Divine Twine to string together a colorful array of Bigger Bitty Bags, one for each month as well as a front and back cover. To ensure you remember what’s in each bag, Jan has affixed a Little Bitty Bag with a Sweet Sticky to the front of each month and enclosed a Colored Tag to list its contents! You can add to the list as you add to the bag. So Smart! For complete “How to” directions, and other fun ideas, please visit Jan at www.pinkhousepages.blogspot.com. Here’s a truly, lovely project from our endlessly, creative design team member Kersti Pederson. 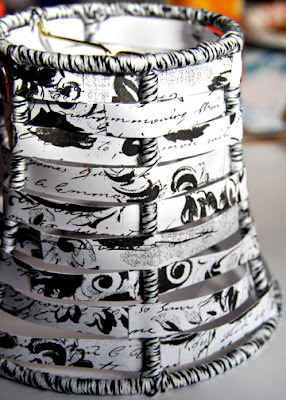 She has used Black Licorice Divine Twine and vintage, toile paper to create a lamp that is both fashionable and functional. 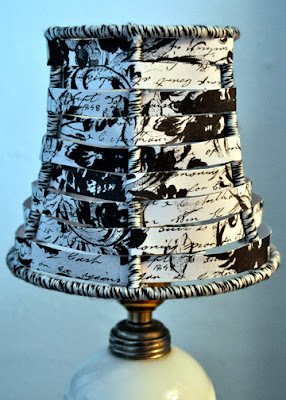 I love how the generous use of twine around the frame of the lampshade and the carefully woven paper has created a fabric-like finish. For a more whimsical look, pair a brightly colored twine with coordinating paper. So many possibilities! 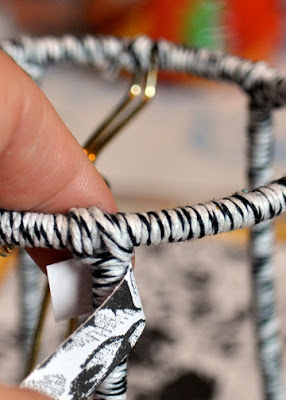 For more projects by Kersti, visit her blog Here. A friend and co-worker participated in a bake sale to help raise funds to donate on behalf of a friend, Susie, who is battling cancer. She asked me to create some things to package their baked goodies. Their group’s name is Team Susie and I made up the little tag line “Tasty Goods for a Good Cause”. I left a blank area on the label to hand write the item name. I had a cupcake image I created a long time ago that I was going to use on recipe cards that never happened. I printed a sheet each of the cupcake image and words on 1.66 round labels, then sandwiched a toothpick between the two labels. Super easy. A pic of the finished goods taken at the event with a iPhone. My son is taking Photography in school this year and is really getting into it. 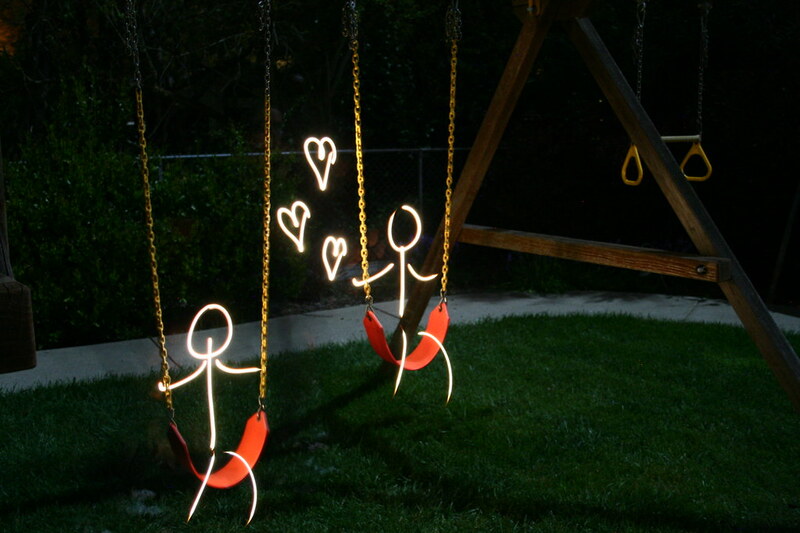 Lately he’s been experimenting with at night with “light painting“. Though he prefers to work with film, last night he borrowed my digital camera and created this photo in our backyard. I love it. Makes me smile. The sweetness of it all. This shot is straight out of the camera. Nice. You can click on the photo and leave a flickr comment for him (makes his day any time he receives a comment on one of his photos). If you’d like to see more of his work, you can visit his Flickr photo stream here. Have you watched Shark Tank before? I’m a little late to the party and only discovered this show late last season, but now I’m addicted. I could talk business possibilities all day long and I find it fascinating to see how the investors (sharks) think and strategize. It’s on ABC Friday nights, but you can also catch a past episode here. Last Sunday I took a day off from working and watched some movies. Kings of Pastry being one of them. I loved this documentary! It follows 3 chefs who compete in the very prestigious Meilleur Ouvrier de France competition that happens every four years. You get to see the chefs prepare for and compete in the event. It was impressive to see the dedication of the chefs to their craft and the amazing pieces they created. I found it refreshing to watch a competition that was not about trying to beat out other contestants to win, but about reaching a level of achievement and have the victory being an internal victory. The support and feeling of brotherhood coming from the judges was emotional (I cried. I know. I cried over a pastry competition documentary. Whatever.). It really is a great movie and if you have Netflix, you can stream it. Instant gratification. I love that. Has anybody else seen this movie? Do tell. Last weekend I met up with some fellow bloggers/friends in Dillon Beach, CA (20 minutes from Petaluma) to share ideas, stories, life lessons and laughs (while we ate a whole lotta cheese). It was a fantastic weekend and would do it again in a heartbeat! Though we talked a lot about business, we also went thrift store and antique shopping, watched a movie and walked on the beach (reality check: I took a nap, but others did enjoy the beach). The wonderful women are what “made” the weekend, but I realize that where we stayed made a huge difference. We were lucky enough to stay at a friend’s beach house so we had the space and conveniences that a hotel couldn’t offer. Having breakfast in our jammies while gazing out at the ocean was bliss. My friend has just started renting out her beach house and I thought I’d share some photos in case anyone is looking for a place to vacation or organize their own meet up with friends/family or a creative weekend. This is listed on VRBO (Vacation Rentals By Owner) if you’d like more photos and info. The listing number is 344678. You can also click here. My 7th grade daughter and her pal created a cake to enter into their school’s International Week Cake Competition. They were so excited to hear their names over the PA system when it was announced that their Taco Time cake had won for Best Overall Cake. Check it out. The “salsa, sour cream and guacamole” are different frostings, the “lettuce” is green cake shavings, the “cheese” is coconut dyed yellow, the ground meat is crumbled chocolate cake and the “diced tomatoes” are Twizzler snippets. Ok, maybe I’m a little biased cause I’m the mama of one of the creative bakers, but seriously cute, right? You are currently browsing the personal category at Whisker Graphics.